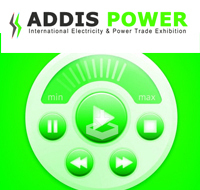 Electricity & Power 2019 - Addis Ababa, International Trade Show on Electricity & Power. The exhibition will be held in conjunction with Trade Africa 2018 from 9 - 12 October 2019, at Addis Ababa - Ethiopia. Electricity & Power 2019 - Addis Ababa provides a unique opportunity to expand your brand in one of the most astonishing business destinations in Africa. The Exhibition attracts exhibitors from over 15 countries. Over the past few years, Kenya has emerged as a major regional trade centre. This is mainly due to a very friendly and business like atmosphere it offers to foreign investors and products. Electricity & Power 2019 - Addis Ababa attracts visitor from different countries as a mass visitor campaign is launched to make a prosper event. Visiting countries include Tanzania, South Africa, Congo, Sudan, Uganda, Rwanda, Botswana, Nigeria, Mali, Ethiopia, India, Egypt, UK, Germany etc. Kenya is located in Eastern Africa, bordering the Indian Ocean, between Tanzania and Somalia. It covers an area about twice the size of Nevada. Kenya has a tropical climate along the coast, turning increasingly arid farther inland. Low plains rise into central highlands bisected by the Great Rift Valley, with a fertile plateau in the west. Natural resources include gold, limestone, soda ash, salt barites, fluorspar, garnets, wildlife, hydropower, and rubies . Over 31 million people live in Kenya. Both English and Swahili are official languages of Kenya, while numerous indigenous languages are spoken as well. Ethnically, Kenya is comprised primarily of Africans (99%) including the following groups: Kikuyu (22%) Luhya (14%) Luo (13%) Kalenjin (12%) and Kamba (11%). The country's religious groups include Protestant (38%) Roman Catholic (28%) indigenous beliefs (8%) and others. 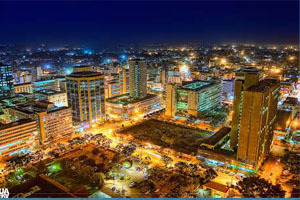 The strength of the tourist industry coupled with years of growth in manufacturing and services has made Kenya, especially Nairobi, the commercial center of East Africa. But after 4 decades of independence, most Kenyans remain impoverished citizens of a struggling state. The richest 10% of the population own an estimated 40% of the wealth. The poorest 30% own only 10%. In the past, economic growth has not greatly improved poverty rates. Kenya has a relatively large middle class that resents repression and corruption from government sources but is fearful of anarchy especially in the face of interethnic clashes. The social structure has been burdened by the influx of some 300,000 refugees from the neighboring states of Ethiopia, Somalia and Sudan. In addition, the population growth rate has only recently been reduced from 3.0%. More than half of all Kenyans are younger than 15 years old. Pressure on arable land is enormous. Creating employment for the number of agrarian workers relocated to urban settings will also be difficult. 31,140,000 people; Kikuyu (22%); Luhya (14%); Luo (13%); Kalenjin (12%); Kamba (11%) Annual growth rate: 1.15% Major languages are English; Kiswahili; Maasai Religions: Protestant (38%); Catholic (28%); indigenous beliefs (26%). Natural resources: gold; limestone; soda ash; salt barites; rubies; fluorspar; garnets; wildlife; hydropower Agriculture: coffee; tea; corn; wheat; sugarcane; fruit; vegetables; livestock and dairy products Industry: small-scale consumer goods; agricultural processing; oil refining; cement; tourism Exports: $1.8 billion Imports: $3.1 billionctions. 310,000 main telephone lines 400,000 Internet users (2002) 38,198 miles of highway 1,654 miles of railroad 231 airfields 357,000 motor vehicles.